After I retired – blessed retirement – I spent about the first six months getting up at the crack of noon and cooking myself an actual real breakfast. I suppose this was to make up for all the hurried breakfasts, the non-breakfasts, the eating in the car of so many years. I made country-fried potatoes, home-fried potatoes, pan-fried potatoes, hash browns, O’Brien potatoes, mashed potato patties, oven-fried potatoes, cooked on olive oil, cooked in bacon fat. 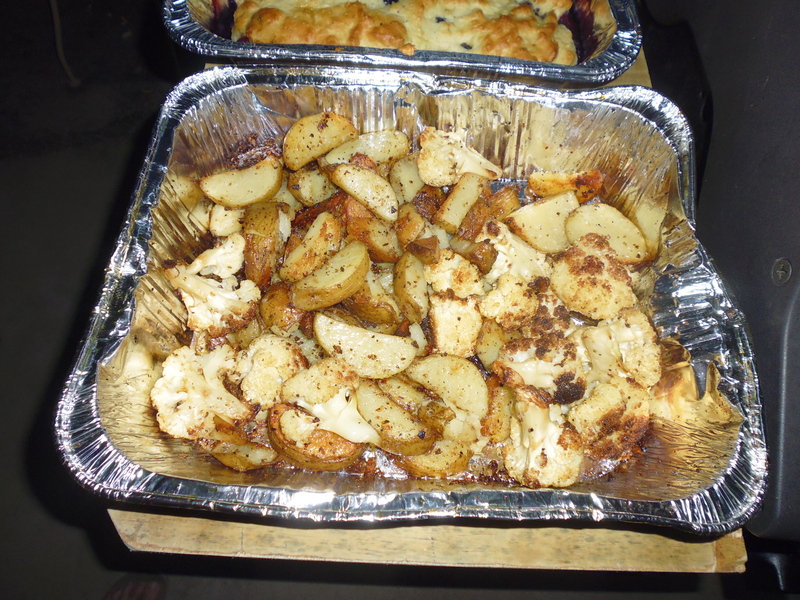 Eventually I found that cubed potatoes that were boiled and then fried made the best home-fries. Then I found out there was an actual name for those – Brabant potatoes, which is somehow associated with New Orleans. 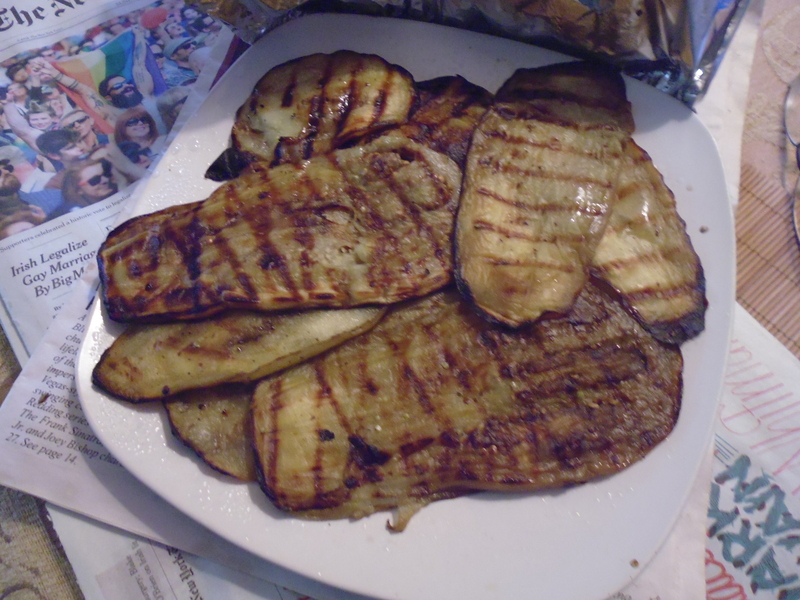 Then I started making them in the oven – oven Brabant fries? And those were really good for dinner. But when summer came along (you can go any time now, summer), turning the oven on was not an option. And that’s when we started barbecuing them. So I had bought a cauliflower with nothing particular in mind for it – it was cheap – and thought that maybe the potatoes and cauliflower could be cooked on the grill together. They turned out really, really well. Amounts are approximate. You could substitute (or add) Brussels sprouts, broccoli, Romanesco, etc. for the caulilfower. And other root vegetables like parsnips, carrots, onions, sweet potatoes, etc. could be substituted for the potatoes. Scrub the potatoes. 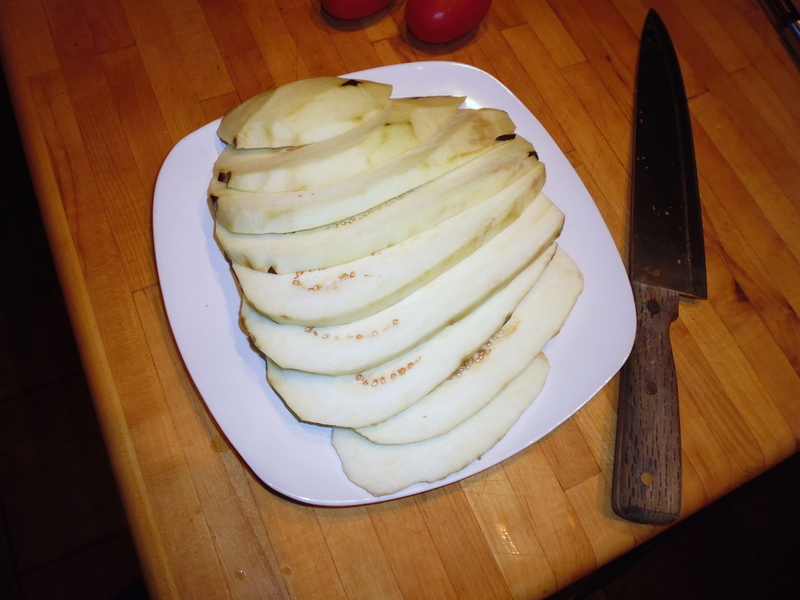 Peel them if you want (though I wised up a few years ago and quit wasting time doing that) and cut into uniform size-and-shape pieces. 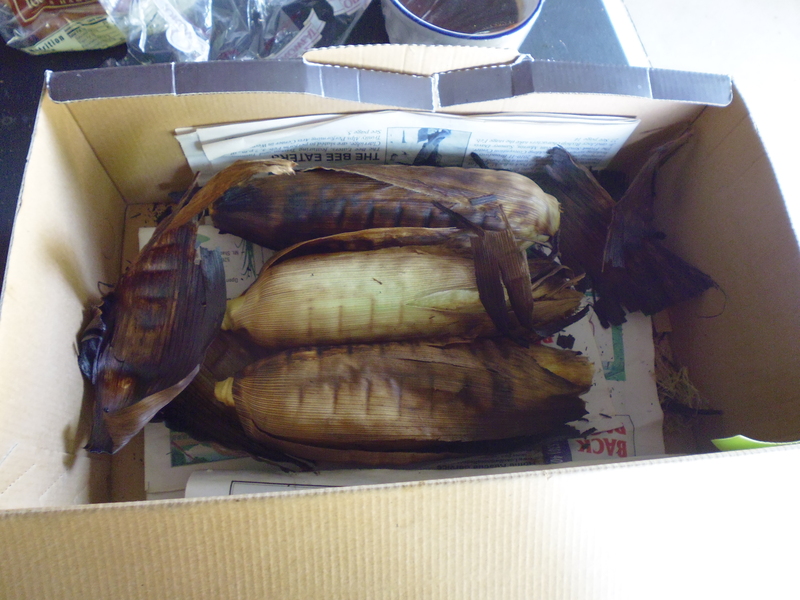 Here I cut them lengthwise, then into half-moons. 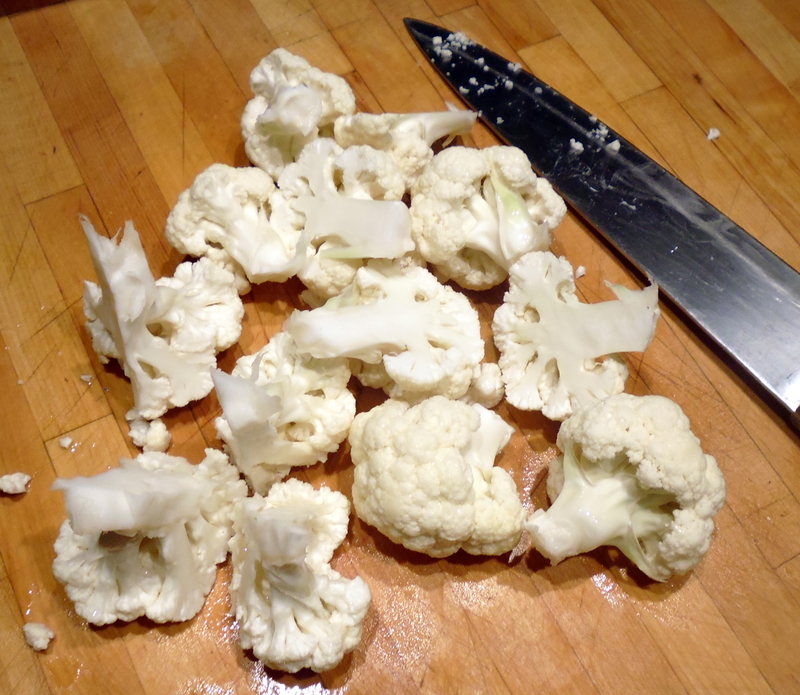 Remove the leaves and core from cauliflower, then break into flowerets. Cut the bigger flowerets into pieces so they are all about the same size. Leave them raw. 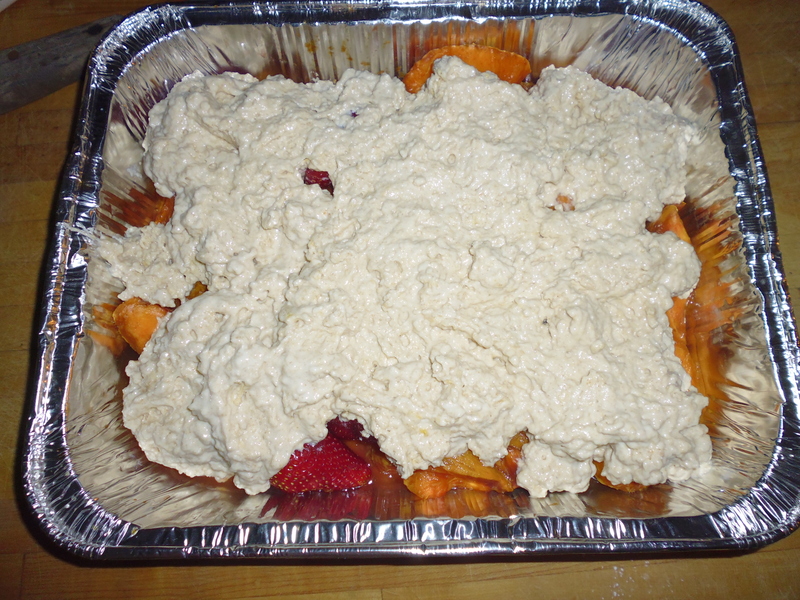 Pour about 1/3 cup vegetable oil (safflower, sunflower, corn, generic mixed oil) into a foil baking dish about 13″ X 9″. Then pour in your choice of spices. 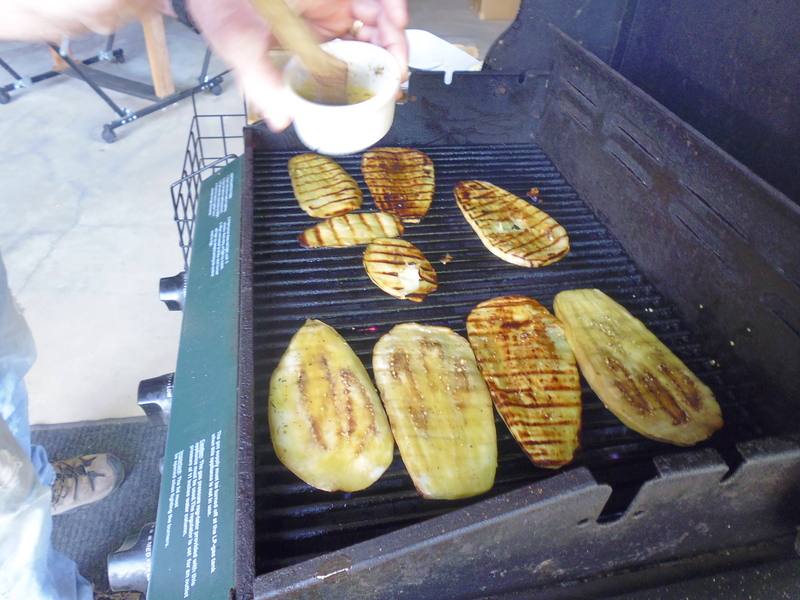 If you have some pre-mixed barbecue rub spices, this is a great way to use them. 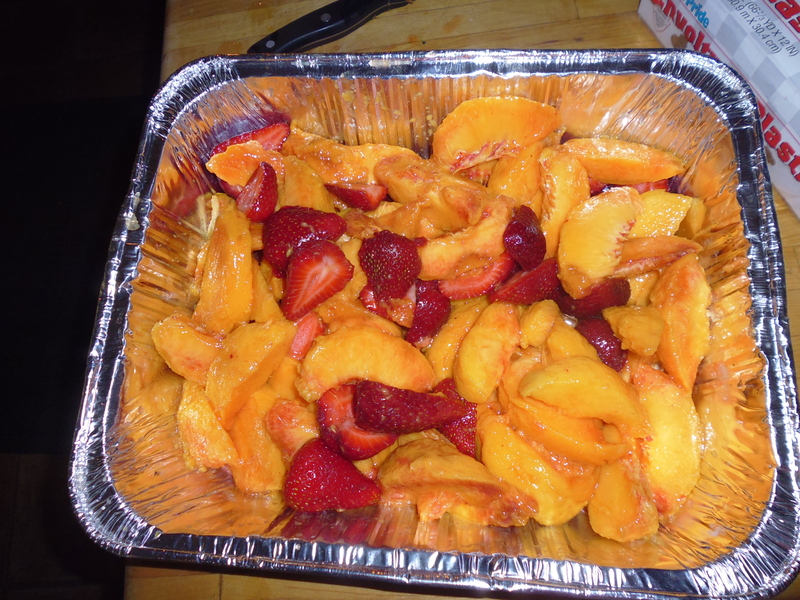 Toss in about two fat tablespoons of mixed spices. Or try some garam masala for aloo gobi on the grill. There are a million secret barbecue rub recipes that Google is just waiting to reveal to you. At the very least, just salt and pepper. Let the oil seep into the spices. 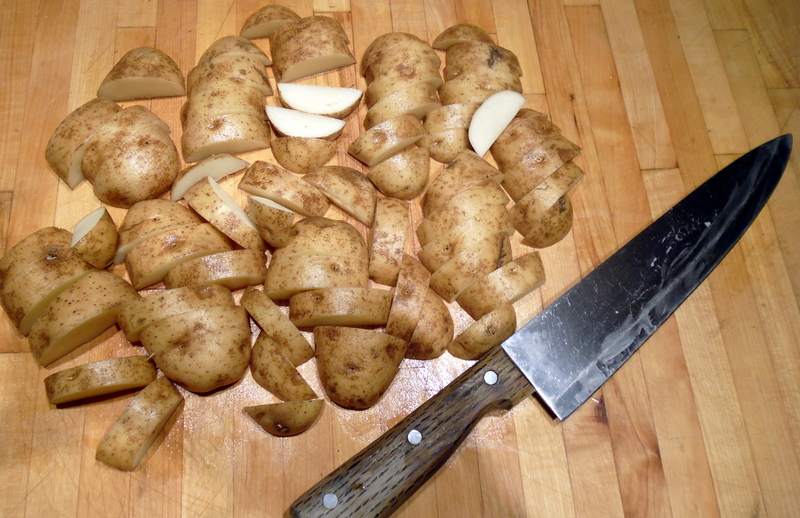 Drop all the potatoes into salted water, bring to a boil, and cook about 5 minutes, more or less. 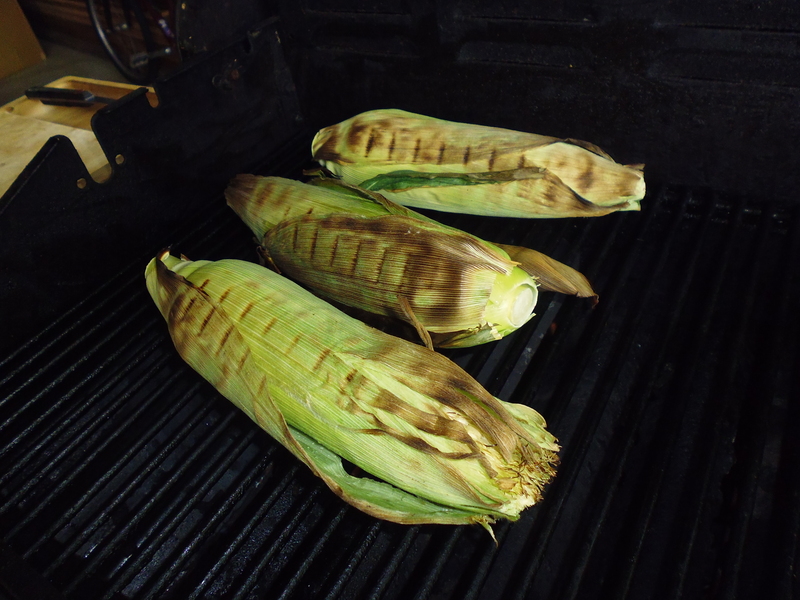 Test the pieces with a knife – if they are just barely tender, they’re done. 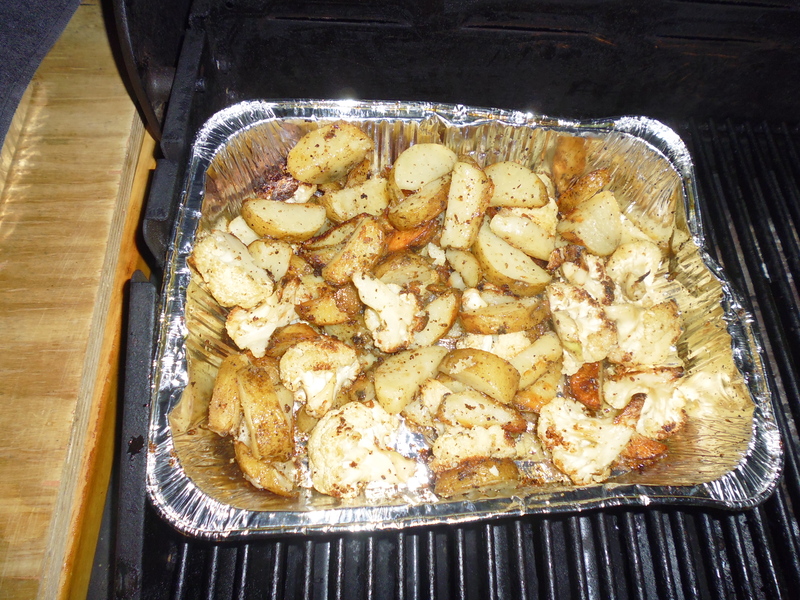 Drain potatoes thoroughly, then mix the cooked potatoes and raw cauliflower into the seasoned oil. Use your hands for this to really get all the spices mixed with the vegetables. 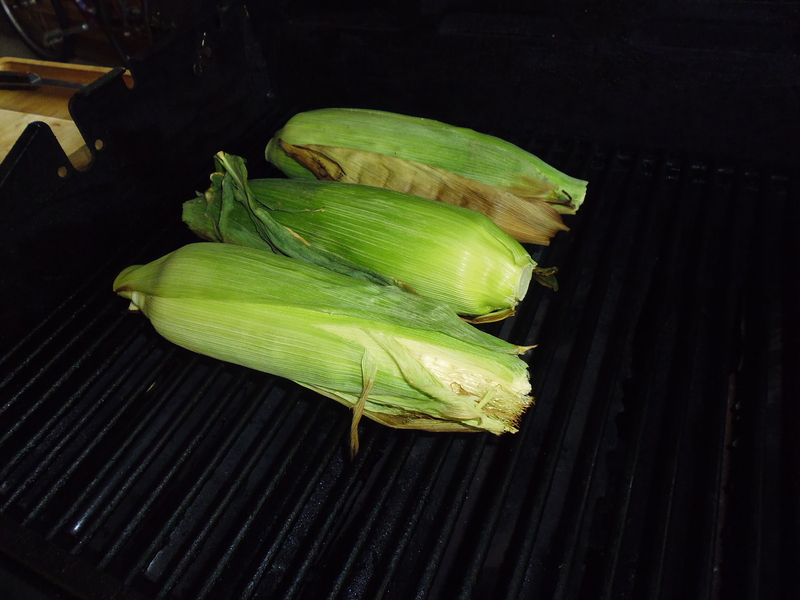 Put the pan on the grill, temperature about 350 or medium or over indirect heat. Do not cover the pan with foil. 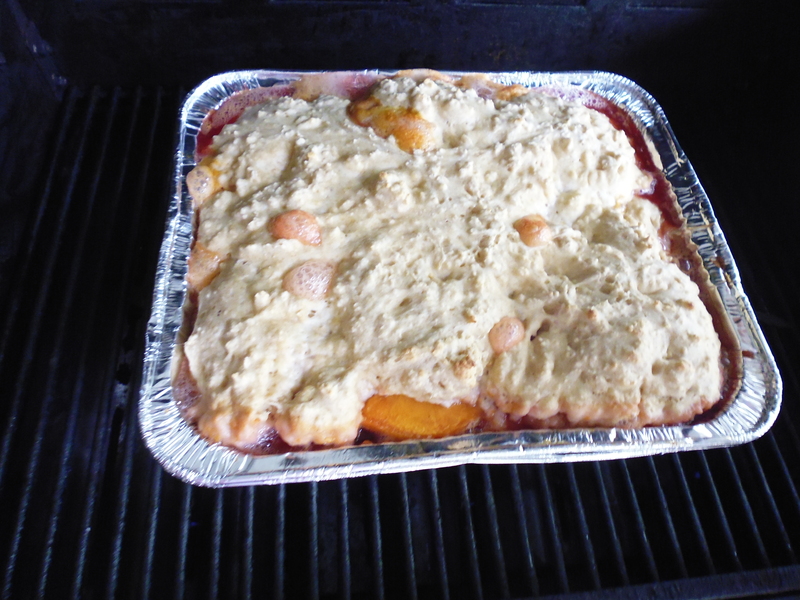 Just put the lid down on the grill and let this cook about 15 minutes. 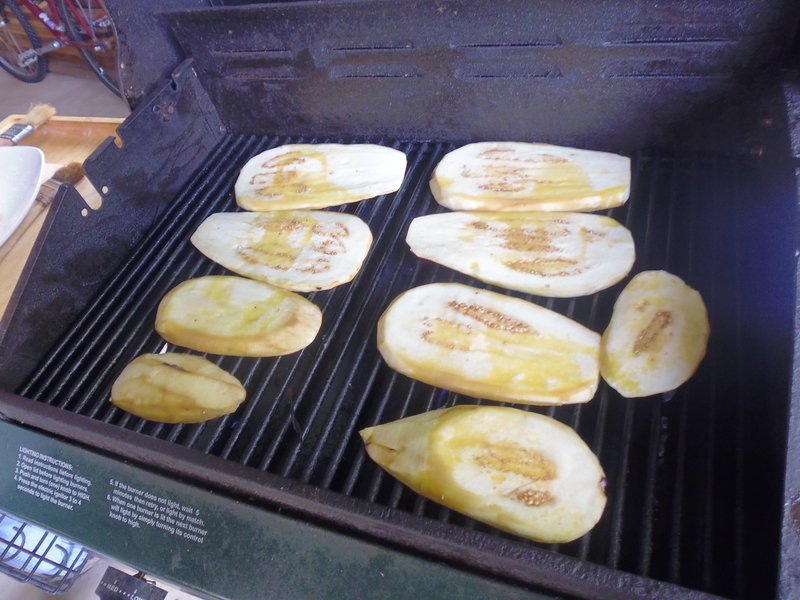 Then use a spatula to turn the vegetables over. All told, they’ll take around 35-40 minutes to get browned and crispy. I am embarrassed to say that my husband and I ate nearly ALL of this in one sitting. 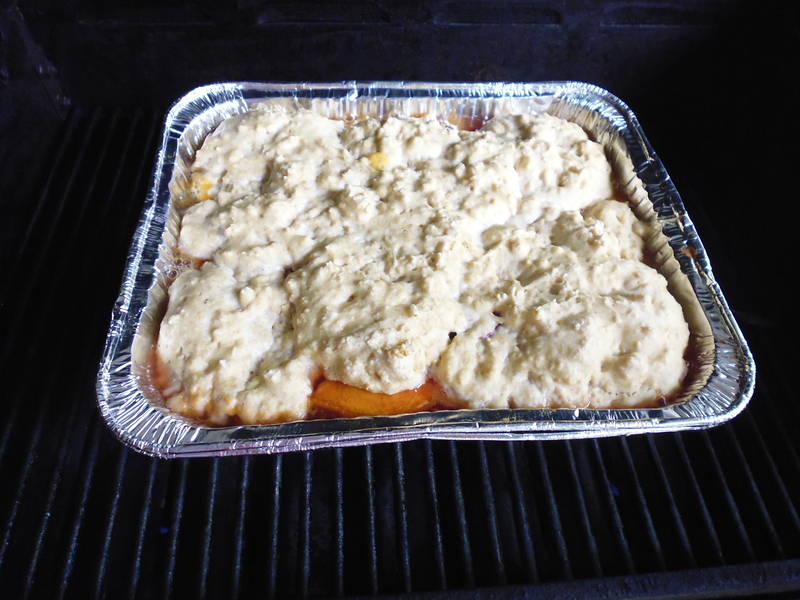 Posted in recipe and tagged barbecuing, cauliflower, gluten free, potatoes, summer, vegan, vegetables, vegetarian. Bookmark the permalink.